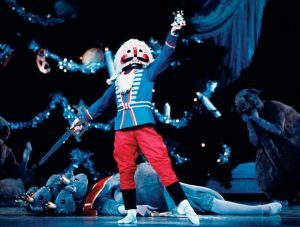 Some of my favorite Christmas memories are associated with The Nutcracker. I first saw the ballet at the Smith Opera House when I was in first grade. At the time I was taking ballet lessons and a few of my classmates were in the performance. Not only did I get to stay up past my bed time (which was a pretty big deal) but I still couldn’t believe that I actually knew some of the people dancing on stage. Every year my younger brother and I got a new Christmas ornament. For a few years my ornaments were Nutcracker themed. One of my favorites is Clara in a purple velvet dress holding her nutcracker from Renaissance Goodie II Shoppe in Canandaigua. Another year it was miniature Hallmark Keepsake ornaments of Clara, the Nutcracker Prince, the Mouse King, Godfather Drosselmeyer, and a fairy that could be the Sugar Plum Fair (for years I had been convinced that the ornament was the Sugar Plum Fairy but according to the box it’s part of the Snowflake Princess Series. If anyone sees a miniature Hallmark Keepsake ornament of the Sugar Plum Fairy from the late 1980s and early 1990s, please don’t hesitate to contact me). One of the first things I did when I moved back to the area was share The Nutcracker with my oldest niece with a performance (again) at the Smith. Evalyn was four and she was completely captivated by the show. During the second act she kept her mother, grandmothers, most of the people surrounding us and myself entertained as she stood in the aisle and mimicked what she saw on stage. Five years later Evalyn has a role in the New York State Ballet’s performance of The Nutcracker this December. With these memories there was no other answer but “yes” when Breadcrumbs Productions asked the Historical Society to host their version of this holiday classic. 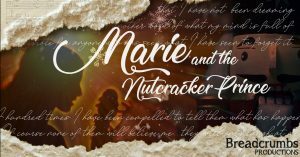 Marie and the Nutcracker Prince is an immersive theatrical journey inspired by the dark and intriguing origins of E.T.A. Hoffman’s original tale (the story most people are familiar with is based on the short story “The Story of the Nutcracker” (1844) by Alexandre Dumas which was an adaptation of Hoffman’s novella “The Nutcracker and the Mouse King” (1816)). Immersed in a dreamscape Russia on the brink of revolution, audiences will meet Marie, her Godfather, and the Revolutionary as they choose their own pathways through Rose Hill. Performances are at 6 pm and 8 pm on December 9 at Rose Hill. Tickets are $20 per person. Space is limited and reservations are required. Call 315-789-5151 for tickets or purchase online at brownpapertickets.com. I hope to see on December 9 for Marie and the Nutcracker Prince. Brought tears to my eyes. Never thought of the trail from you to Ev and The Nutcracker!! !